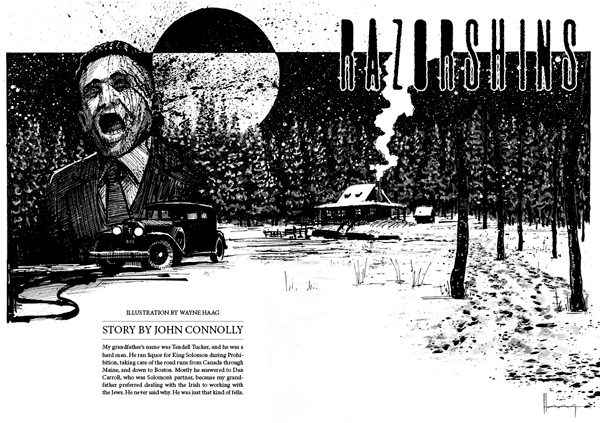 "Razorshins," a new short story included in NIGHT MUSIC: Nocturnes 2, appears for the first time in Issue 47 of Black Static magazine, which went on sale on 02/07/2015 in fine bookstores across the UK and US, as well as online at TTA Press. The July-August issue contains new stories by internationally bestselling author John Connolly, James Van Pelt, Kate Jonez, Bonnie Jo Stufflebeam, Ray Cluley, and Eric J. Guignard. The front and back cover art is by Richard Wagner, and interior illustrations are by Wayne Haag, Dave Senecal, Jim Burns, and Richard Wagner. Features: Coffinmaker's Blues by Stephen Volk (comment); Notes From the Borderland by Lynda E. Rucker (comment); Case Notes by Peter Tennant (book reviews and an interview with Ray Cluley); Blood Spectrum by Tony Lee (DVD/Blu-ray reviews).